Eager to take your dog with you on your next outdoor adventure, but worried about how to take care of them out on the trail? Keep your canine friend safe when you're far from veterinary care by learning how to recognize when your dog needs help and how to provide aid. Eager to take your dog with you on your next outdoor adventure, but worried about how to take care of them out on the trail? Keep your canine friend safe when you&apos;re far from veterinary care by learning how to recognize when your dog needs help and how to provide aid. 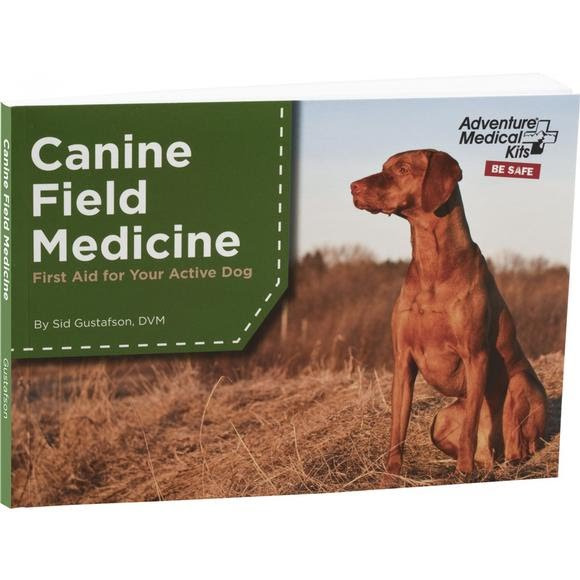 Filled with prevention plans, first aid tips, emergency procedures, and more, Adventure Medical Kits &apos;s Canine Field Medicine Book contains advice from an expert veterinarian and animal behaviorist on how to prepare you and your dog for over 50 situations, ranging from blistered pads to unfortunate encounters with fishhooks. With confidence in your ability to care for your pet, you and your furry friend can enjoy any and every adventure together. Accident Prevention: Follow expert advice on training and protecting your dog to help stop injuries from ever happening. Step-by-Step Instructions with Images: Learn how to conduct CPR, apply splints, and administer other emergency treatments so you can always be prepared. Causes, Signs, Prevention and Treatment: Study professional descriptions and treatment instructions for over 50 injuries and illnesses to protect your dog on every adventure. Vital Signs Chart: Identify and monitor your dog&apos;s vital signs using the provided chart and easy-to-follow instructions to assess the seriousness of a situation. Physical Examinations: Safely restrain and examine your dog&apos;s injuries by choosing the correct restraint for the situation and following the detailed examination protocol. Measurements 5" x 7" x 0.5"